American country music superstar Garth Brooks teamed up with Calgary Flames players and Team Canada alumni on the weekend to share life lessons and the ice with some of Calgary’s young hockey players. Brooks’ started his foundation Teammates for Kids in 1999 to provide scholarships for children to attend ProCamps Sports Camps. “It’s just probably the most important thing I’ve got to put my name on, I’m part of it, I’m not it, which is what I love about Teammates,” said Brooks. The initiative brings the kids together with their sports heroes to learn skills and Brooks makes it a priority to attend every camp to offer encouragement and support. About 50 children from the Calgary area were joined on the ice at Henry Viney Arena on Saturday by Brooks, Calgary Flames’ Kris Versteeg and Troy Brouwer and retired Team Canada player, Carla MacLeod. “You get in those little huddles, those little pods, that’s my favourite thing. Hear these guys talking about respect, courage, discipline and how it applies to your life and not just the sport, that’s what it’s all about and these guys know that or they wouldn’t be here,” Brooks said. “You never want to hear any kids say I can’t or I won’t be able to and that’s why we want to help these kids any way we can,” said Brouwer. “It means a lot to us, I know growing up, it definitely helped me in times like that in my family and seeing a foundation like this and being a part of it and having Troy being part of it and obviously Garth is the face and a guy who gives back in the entertainment world, nobody does it better than him, so very special to be a part of it today and try to give back,” said Versteeg. Brooks sold out all his recent shows in Calgary and walking on the ice with the kids on the weekend, he looked like any other hockey dad. “It’s love, that’s what we’re here for today. So if one of these kids walks away knowing one more friend than they came here, then this camp was a success, that’s where I focus,” said Brooks. The day on the ice with some of their heroes was a dream come true for many of the kids. “I had dreams when I was a kid, I’ve been able to accomplish a lot of them, but that doesn’t mean that I still don’t have dreams now and that’s one thing that we also want to portray to the kids too is you’ve always got to continue to follow your dreams and if you do get the chance to have your dream come true, make a new one and follow that,” said Brouwer. “Hockey, come on, let’s just face it, they’re the sweetest guys on the planet and girls and all they want to do is skate and help kids, so it’s an honour to be here today,” said Brooks. The Teammates for Kids Foundation has shared over $100 million in donations and scholarships in more than 60 countries. For more information on Teammates for Kids, click HERE. 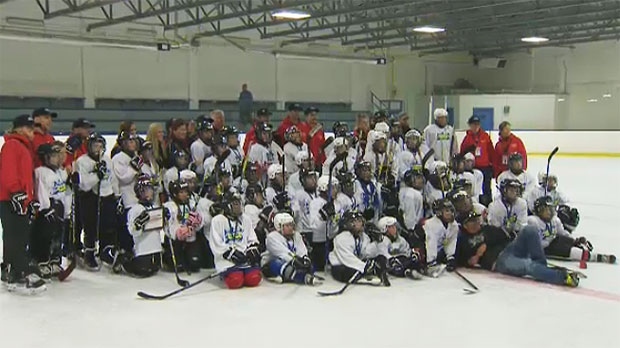 About 50 children from the Calgary area took part in the camp at Henry Viney Arena on Saturday.